As you probably saw a couple of weeks ago here on the blog, StashMyComics’ very own Chip Reece is writing Metaphase, a graphic novel inspired by little heroes with Down Syndrome. Though the free preview will hit ComiXology on May 4th, the same day as Free Comic Book Day, I’ve been lucky enough to get a look at the preview pages a little early. So, sit back, relax, and let’s take a look at the first pages of Metaphase! These pages can be thought of mostly as an “origin story”. The first few pages are all from the perspective of Ollie’s dad, a powerful superhero who is the strongest of the strong. He easily defeats a villain sporting robotic face tentacles, but it’s the “normal” things that give him the most trouble. It’s on the day of Ollie’s birth that he truly feels afraid and helpless. Ollie is born with Down Syndrome and has heart defects, and there is absolutely nothing his super strength or indestructibility can do about it. It’s only after months and years that Ollie’s home life stops feeling like the hospital and he begins to play just like the other children. It’s then that we cut to a very different scene. Ollie is watching as his dad faces an enemy that is even stronger than he. It’s in a last ditch attempt to save his father that Ollie is hit with an energy blast that reacts strangely with Ollie’s extra chromosome. What exactly this strange transformation will entail is unsure, but it looks like Ollie will be made even more extraordinary because of having Down syndrome. These short ten pages of story show both Chip’s love for comics and his passion for this story. As the story is inspired by his own son, Chip has put his all into telling it. There’s some humor, some action, and a ton of heart. Though these pages are just the beginning, I truly think that there is something special here. It’s a story with a cause and one with a lot of passion in it, and it’s not too shabbily written either. The art by Kelly Williams is top notch. The expressiveness of his characters lets the reader fully see both the joy that is felt in various scenes and the fear and anguish felt in others. He’s equally at home drawing a superhero defeating a villain as he is drawing a husband and wife worrying for their son. It’s his diversity that helps make Metaphase work. Now, I’ll skip the rating this time, as it’s possible that I could be a bit biased. But, I think the pages speak for themselves. There’s a lot of love put into this comic. It’s a comic with a cause and it’s done with a high level of skill. The ten pages that I’ve seen give me high hopes for the finished product, and I think others will agree with me when they see it. So be sure to check out the free preview when it’s made available on May 4th! If you’d like to stay fresh on Metaphase news and announcements, visit the Facebook fanpage and hit Like. This graphic novel is in early development, and will eventually seek support via crowd funding from those who would like to see it through to completion. 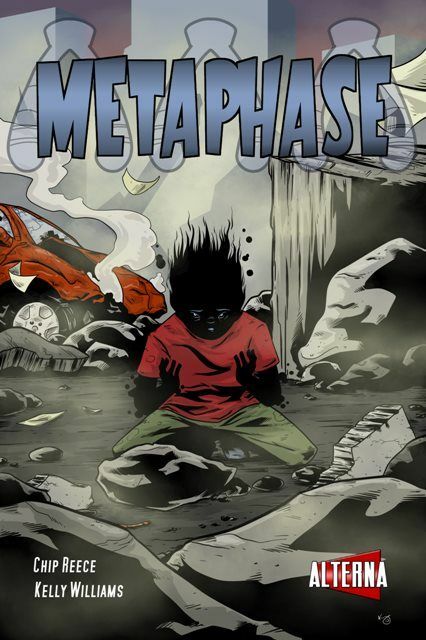 So, tell everyone you know about Metaphase to spread the word! Good call on skipping the rating. Congrats Chip! You were meant to write this! So awesome and so stoked for you, Chip! Aww thanks Jason and appreciate the review Leo! I think if he didn’t know me he still would have given it ONE BILLION stars. Right Leo? Thanks Kenny! Very thankful for your support! I think I’m more pumped for this book than any other to come out this, or next year! Chip, I think it’s awesome what you’re writing, and what you’re writing it for. You’re a great man, an awesome dad, and one helluva comic book writer. Keep it up! Can’t really say more than Tim already said. Any time a writer has his heart in what he’s writing, it shows in the work, and I know you have a huge heart for your son. Can’t wait to read this. Tim and Jason M: Really appreciate all the cheers and encouragement. Can’t wait for you both to see the full thing! I can only give it one billion stars? Man, I guess I’ll have to settle for that. As I said in the review, there is a lot of love put into these pages by you, Chip. And Kelly is really a top notch artist. It’s a great mix and I’m extremely excited to read the finished story when it’s eventually put together.